DMXcat works with Android, iPhone, and Amazon Fire. DMXcat technology is covered by U.S. Patent # 10,129,964 B1 and other U.S and foreign patents pending. USB to Micro USB cable, 6"
Tip 2: How do I reconnect to my DMXcat? Simply click the chain link icon, which is in the lower left corner of the main screen, to start up a new connection; no need to go into your app's settings. Tip 3: How do I add a fixture to the fixture database? Use the “Report Problem” option in the settings menu to contact our support and development team with the fixture you'd like to add. How do I delete a preset from the DMX Controller app? Simply swipe it left and press “Remove”. Tip 5: Why does my fixture move when connected to DMXcat? The fixture database in the Fixture Controller app has default values for every attribute of each fixture, such as pan and tilt at 50%, which will cause your fixture to move once connected. If you want your fixture to remain static, you can turn off this default setting in the main settings menu through “Load Default Values”. Once off, every attribute will load at 0%. If you find a default value that needs to be updated, please submit it with the contact option in the menu. How do I set my moving light to the home position? Use the 3-dot menu in the Fixture Controller app to reset all the DMX values for your moving light to their default home positions. This menu also offers easy access to your fixture’s user’s manual and a contact option to send corrections and feedback to City Theatrical. 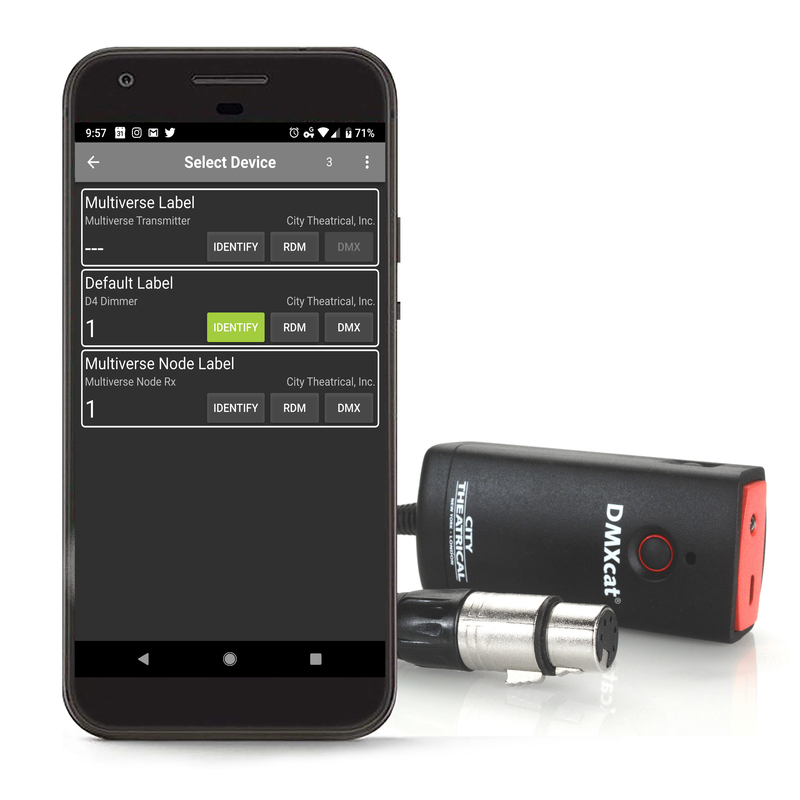 Which DMXcat app will help diagnose issues with fixtures in a DMX line? The Analyze DMX function in the DMX Tester app can give you valuable information about the data coming from your lighting controller that can help diagnose the problem. The three sections that are of the most immediate help are “Number of Slots”, “Update Rate”, and “Received Start Codes”. 1. The “Number of Slots” tells you have many DMX values the lighting controller is sending from a maximum of 512. This can help you determine how many unique devices your controller can address. 2. The “Update Rate” is helpful for identifying why fixtures might be misbehaving. The maximum speed is typically 44Hz (it can be faster if fewer than 512 slots are being sent.) If a fixture periodically flashes, or goes out and comes back, then it may not be able to keep up with the full specifications of DMX. 3. In the “Received Start Codes” you will usually only see two possible values: 0x00 (for a regular DMX packet) and 0xCC (when RDM traffic is present). If any other values are present, then there is likely a bad connection or broken cable in the DMX line somewhere. There are some lighting manufacturers that use other start codes for their equipment but running across these is rare. If you have problems with a fixture flashing every few seconds, it may not be responding appropriately to RDM on the DMX line. Make sure that RDM is off at all consoles, gateways, and wireless receivers until the 0xCC doesn’t show up in a new scan. How do I test individual fixtures in the DMX Tester app? You can test individual fixtures with DMXcat by setting the Transmit Speed Preset to “Max” in the Transmit DMX screen of the DMX Tester app. This will send DMX at the fastest rate the DMX512 specification allows. If the fixture misbehaves, slow the speed down until you get consistent control. Most lighting consoles and DMX gateways can have their DMX speeds adjusted. Slowing down the DMX rate rarely affects any output on stage. Sometimes turning on the “Hold Last Look” feature of the lighting fixture can compensate for the issue. If you need additional help using DMXcat to diagnose problems in your system, please use the “Report Problem” button in the app’s settings screen to send an email. Or call City Theatrical at 800-230-9497 and ask for support. Need to organize your RDM devices? Most fixtures will let you assign a custom label that will be displayed in the RDM list. You can also sort your RDM devices by Manufacturer, Model, Label, or DMX Address by clicking the 3-dot menu in the upper right of the RDM Controller. Need to identify which fixture you are setting up with RDM? Most RDM fixtures will flash the intensity attribute or their displays when they get an RDM Identify command. You can use the Identify button on the main RDM Controller screen, or use the light bulb icon in the upper right, when already configuring RDM for a specific fixture. What are people saying about DMXcat?